Melamine dinnerware is virtually indestructible and it's perfect for young and old, for an elegant and colorful table set, or for outdoor trips. We are used to seeing it paired with plates for children. But there are many solutions, also for adults that use, the melamine as a base material andwith chic finishes. All this thanks to innovative designers that offer several versions, colorful and very original. They range from total white style pottery and porcelain, that maybe, just to touch, find out not to be such, solutions ipercolorate and ideal for outings and picnics outdoor with the whole family, including dogs. But let's take a closer look of what melamine is. melamine, is a plastic compound, nitrogen, used in the realization of the polymers and for the preparation of thermosetting resins. Discovered in 1834 by Liebig, began to be used in the industrial sector only after 1940. Precisely with these resins, and thermosetting plastics are manufactured, as well as furniture and accessories for the home, too many dishes and kitchen containers, characterized a smooth and glossy surface. 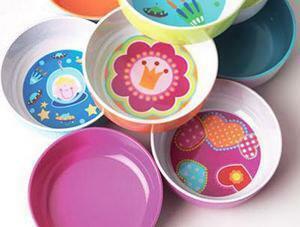 Melamine allows many operations and almost infinite colors. As the creations of American designer Jackie Shapiro for French Bull: a series of table accessories, made?entirely with melamine. A line decidedly pop, inspired by the 60s, with geometric shapes, ipercolorate and floral motifs of high impact. 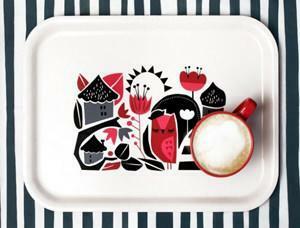 Also very appealing creations melamine in Nordic style of Little Studio. The Swedish team offers a collection for the house of type Nordic happy design, mixing tradition and modernity, with irregular geometric patterns and designs. 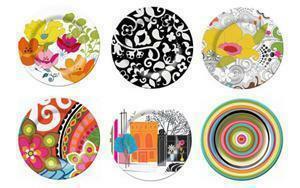 Plates, trays and platters, but also that there is no reason to hang on the wall like a beautiful painting. Also in Nordic style, very romantic, the collections of the Swedish study Darling Clementine. Geometries typical stylized in warm colors combined with black and white. Pattern that we find in coordinated whole line, ranging from cushions, curtains, to the trays, dishes and greeting cards. 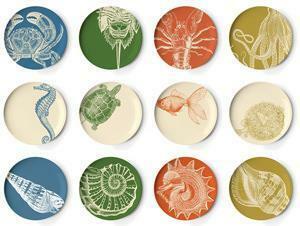 Simple and elegant, as well as colorful, but in soft tones, even the dishes melamine collection of Thomas Paul. Inspired by sea life, underwater creatures reproduce, cha ranging from the octopus, the snail, until the sea turtle, a series animals of the savannah or a few species of migratory birds. Motifs and patterns worthy of the fashion world, Paul arrives with his degree in textile design in New York City and subsequent collaborations with brands such as Oscar de la Renta, Calvin Klein and DKNY. Elegant such as porcelain, also the creations of Bongenre, Jill Fenichell. Antiques Brooklyn and designer of porcelain, one day decided to experiment with melamine. And here these wonderful collections, full of history and classical motifs, figures and flowers, all strictly resin. The collection Dinnerware, created by studioMOM for Widget is very beautiful. Perfect for children and adults, the collection consists of plates, bowls and cups in melamine, and it is available in various colors and decorations. 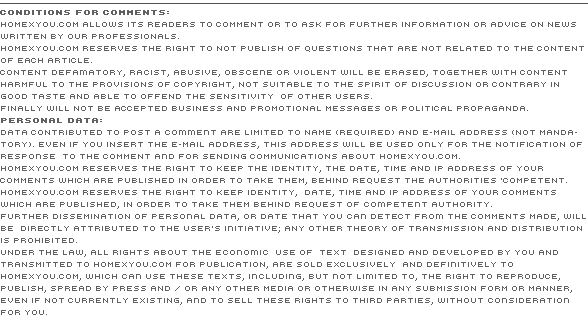 Italy is the leading company history Mebel, that since 1957 designs and produces design objects designed for the art of the dinnerware. We have already spoken up for dinner, but specifically, the new Small Entities, designer Marco Maggioni, made of white melamine and other color variations, is well suited to different functions, ranging from home-made dinners, up to most classic of catering. Another brand is Mario Luca Giusti, from Florence. 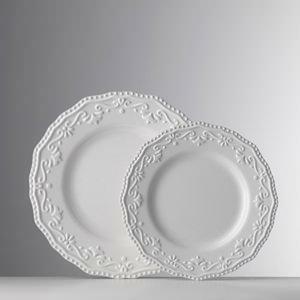 Sophisticated aesthetic, its melamine dishes recall ceramics in the white version. But also extremely practical, especially in outdoor meals or snacks that also involve children. Lines such as Tenax, are available in various colors and embossed. They match perfectly with the glasses, always in style, such as Crystal, all in just over 20 euro. In addition to aesthetics, melamine is extremely practical. Resistant to knocks, scratches easily and is lightweight and easily transportable. The dishes are also dishwasher safe, although high temperatures, in general, can cause loss of gloss surfaces and in the past also release harmful substances in part. They have only one flaw: it can't be used in the microwave oven. Valutation: 4.67 / 6 on 3 votes.